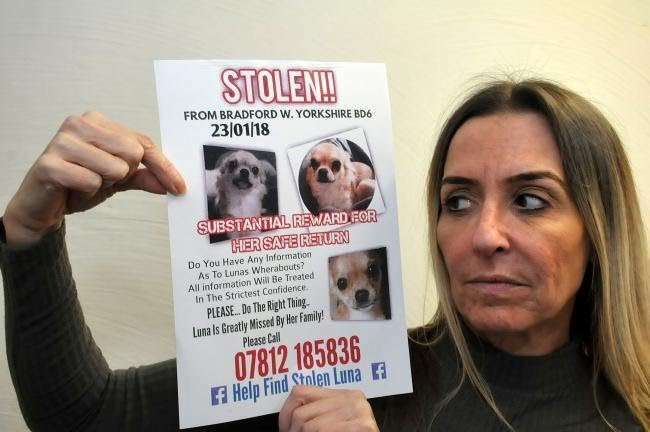 ALMOST 80 dogs were stolen from Bradford owners in the last two years – with the vast majority of them never found. West Yorkshire Police received 338 reports of stolen dogs in 2017 and 2018 and 78 were from pet owners across the district. However, according to figures obtained from a Freedom of Information request to the force, only 24 dogs out of the 338 reported stolen were found. A quarter of the dogs recovered were returned to their Bradford owners. A total of 41 arrests were made in connection to the thefts. Angela Pinder and her family know are going through a rollercoaster of emotions after their pet chihuahua Luna was stolen from their Torre Road home’s garden in January 2018. The family claim the short-haired dog, which has a distinctive bent left ear, was stolen when a thief climbed over the six foot fence surrounding the garden and unlocked the gate from the inside. She still finds it hard to talk about the theft, such is the devastating impact it has had on everyone involved’s life. “It’s an absolute nightmare,” she said. “Nobody has any idea what we are going through. “I’ve lost a lot of weight because of this and I’m on anti-depressants. Kathleen Easton, Ms Pinder’s sister-in-law, set up a Facebook group called Help Find Stolen Luna to try and recover the beloved pooch. It now boats 3,500 members from across the world. “Your dog is your family and it’s a living hell,” she said. “We have good days and bad days. “Both of our businesses have suffered because if we get a tip off we go anywhere at the last minute. “She was a family dog and if I didn’t have her then my sister-in-law had her. “It takes over your life and we are drowning behind the scenes with messages of support from all over the country. “She was 100 per cent taken from our garden. “Small dogs are being stolen all the time and Staffies (Staffordshire Bull Terriers) are being trained for dog fighting and others are stolen for breeding. It is compulsory for all dog owners to have their dogs microchipped in this country and recorded with a database. A spokesman for West Yorkshire Police said: “We take all reports of theft extremely seriously and are happy to work with householders and businesses to offer crime prevention advice.